st. louis county - B.E.L.T. The St. Louis Beacon recently published a conversation with developer Richard Baron, full of illuminating opinions and something I didn’t know previously: Lambert Airport could have been in Waterloo, Illinois. “There was the situation with Metro. 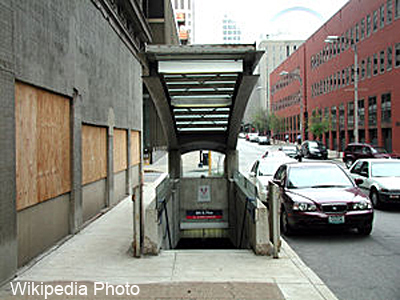 When all of that started back in the ’80s there was no plan to take advantage of these transit stations — to build housing around them, retail around them. To use them as an economic driver, as was done in many other cities around the U.S. when light rail went in. Here was this enormous investment that was made, and look at the stations, and they’re bleak. And if you haven’t already, The Beacon is a must for followers of the STL built environment, along with Building Blocks at the Post-Dispatch. 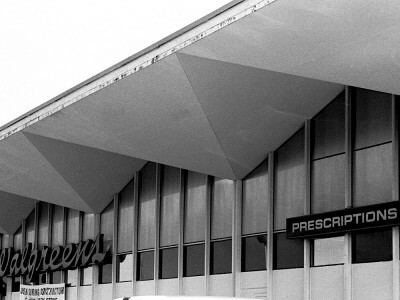 My favorite Walgreens no longer exists, and this is a highly ironic story. In South St. Louis City, we’re used to them tearing down bowling alleys so they can build a Walgreens. 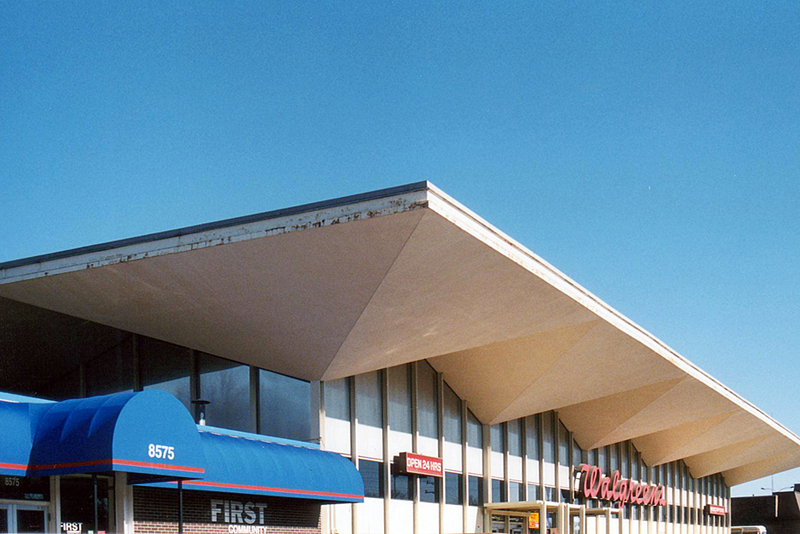 But in this case, in 2003, they tore down a Walgreens to build another Walgreens! It’s all true. This mid-century fabulous Walgreens was on Watson, just a scootch east of the intersection of Rock Hill/Elm. This one stayed open while they built a brand new one right at the intersection proper. 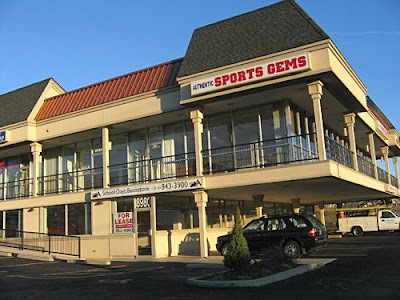 Once it opened, they tore this one down, and now a short strip mall with a Blockbuster Video stands in its place. To this day, I still see a phantom image of it as I pass by. It’s roof reminded me of the Flying Nun’s head gear as she was airborn. And it’s still a weird feeling to miss a Walgreens… know what I mean? 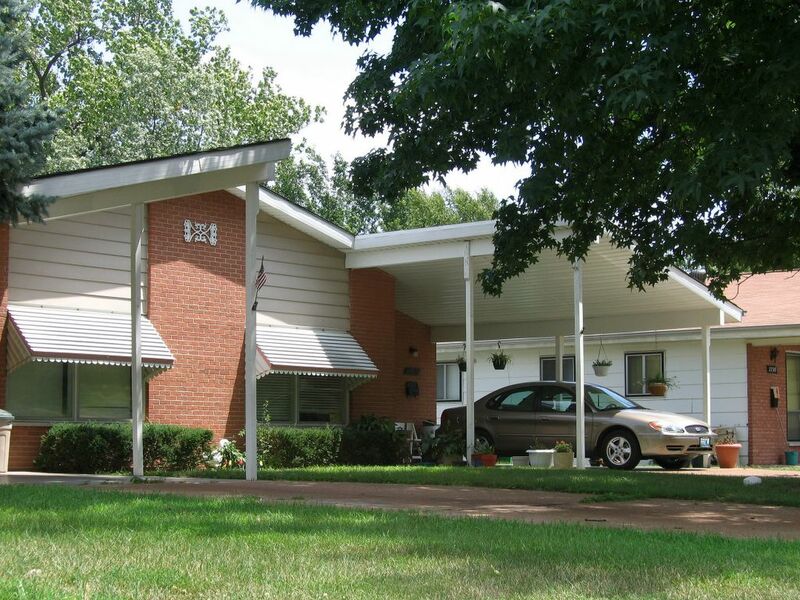 Below is a Living St. Louis piece about Pagedale, one of many inner-ring suburbs in St. Louis. Within, we learn that if you follow the subprime loans, you find the most foreclosures. Also of great interest is the racial make-up of the municipalities hardest hit by subprime foreclosure (see this interactive map). Circumstantial evidence indicates that redlining is still standard practice in St. Louis. It’s very disturbing and very sad. On the inspirational side, the ever-mounting number of empty homes in our inner-ring suburbs is a great opportunity for forward-thinking developers interested in the financial and societal advantage of re-using and improving our existing housing stock. As we hit rock bottom, this idea is not as much of a fantasy as previously believed. The Creston Center, Before. It was a simple and spare 2-level shopping plaza built in 1961. Note the snappy vertical sign to the left, in the auto-centric spirit of this stretch of Route 66. To its right is another 3-sided sign that spun around so 3 major tenants could have equal billing. And a tiny out-building sat close to the corner, making the most of every square foot of land. The Creston Center, After. The ginchy Creston sign topples, as does the out building, and the remodel is a hot mess. 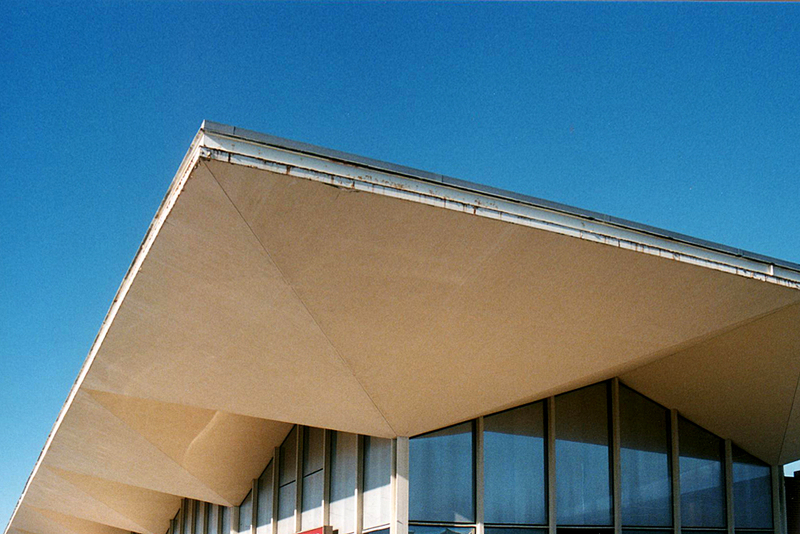 Now, I’m not saying the original was an important piece of design worth preserving intact. 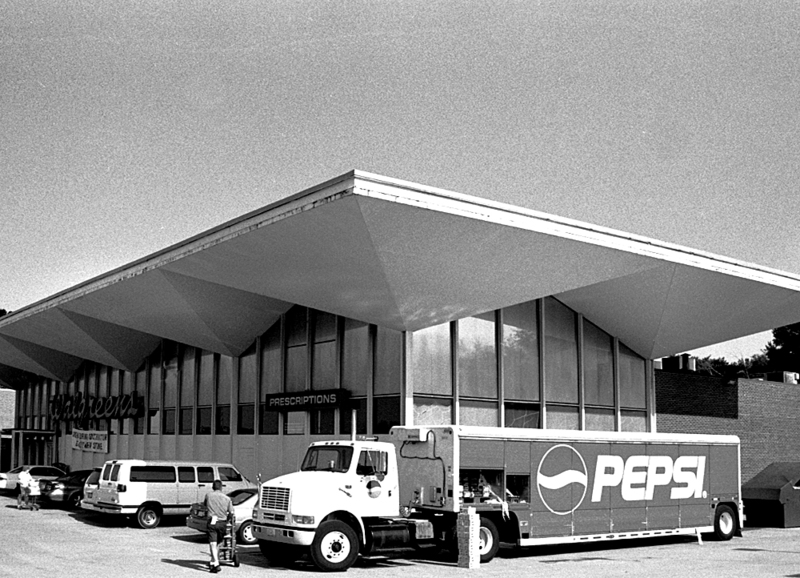 It was very appropriate and utilitarian retail design for the time, and the cantilevered balcony that created covered parking for the lower level is a nice mid-century modern touch. Its simplicity kept it under the radar in the 21st century, but in a bid to jazz up the place and get a full tenant load, the owners paid for a remodel that is just… a steaming hot mess. 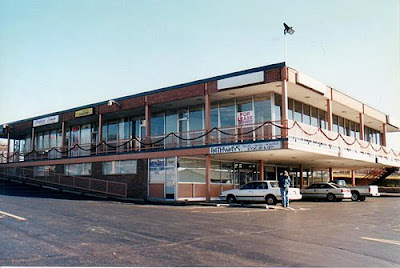 In December 2002, when the above photo was taken, the place was about 65% rented. Today, the place is now about 50% rented, so remodeling to make it more attractive to tenants didn’t really play out as intended. And “more attractive” is obviously in the eye of the beholder. Minimal lines and a flat roof are anathema to current day retailers; they want more “there” there to catch the eye of modern shoppers. So they put bulky caps on the slender metal poles and went to town on the roof. They gave that roof a height and heft and flash which creates the feeling that the cantilevered balcony is just going to collpase under all that rigamorale. Why the mixture of shingle mansard and pup-tent standing seam metal? I would have loved to hear the “designers” rationale for this absurd combination, especially because the addition of standing-seam boosted the budget for no good reason. Did they claim that this over-scaled mish-mash would create a dynamic energy so crucial for luring shoppers? Or that the mansards would indicate the prime locations in the building? Or was the rationale as mundane as the metal would ease the cost of re-shingling in the future? 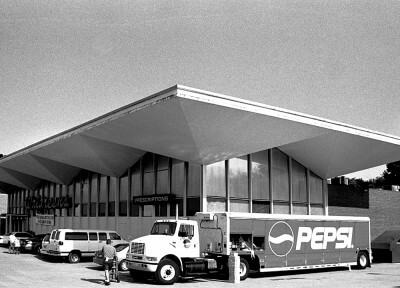 Whatever the case may have been, the Creston Center was an overlooked and unassuming retail center that became a 3-ring circus of hubris and bad taste. I cringe every time I pass it and feel bad that their remuddle became a huge waste of money and intentions. 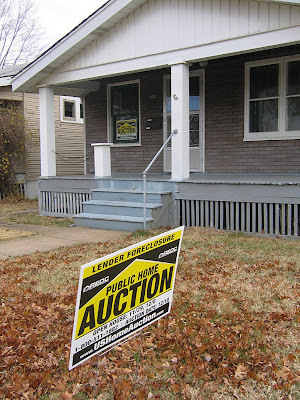 Watching neighbors move and public auction signs multiply is depressing and frustrating. But rather than sink further into feelings of helplessness, now is the time to think of solutions for the present and plan for the future. Optimism is the strongest ally of possibility. ● Economic downturn is preservation’s best friend. When developers lose access to loans, they stop eyeing buildings for demolition. Right now, a threatened building is safely tucked away in a cedar chest under a layer of mothballs. ● Look around your neighborhoods and notice that the teardown pandemic has ground to a halt. There is no money or buyers for in-fill McMansions, so there’s no point in continuing this practice. This also means homeowners who have been willing to sell to new home builders now have to stay put and come back to good terms with a home that was perfectly fine before the allure of “easy” money. Houses have been getting bigger fairly steadily since the Census Bureau began tracking the average size of new U.S. homes three decades ago. But now the economic downturn is likely to turn that trend around, says the Associated Press — particularly as production builders continue to scale back floor-plan sizes. After trimming some of its 3,400-square-foot homes to 2,400 square feet last year, for example, Los Angeles–based KB Home recently rolled out a new line of Southern California homes that start at 1,230 square feet and are priced at just over $200,000. ● The cost of living far away from business and retail centers is also taking a toll. Everyone is now acutely aware of how much it costs to drive, and many have voluntarily found ways to reduce that cost. A Center for Neighborhood Technology report shows that people who live in cities and inner ring suburbs spend up to $2,100 less annually on gasoline than residents of outer ring suburbs, who can easily average $4,000 a year on gasoline, alone. Today’s economic downturn puts many of us in the position of going backwards. When we have to give up the large house that’s an 80-mile round trip from work, it can feel like a failure. But for those who have survived being unemployed or broke, we often learn that less quantity can improve the quality of daily life. Being forced to give things up never feels right, but in the long run, accepting the way things are generally works better than fighting for the way we think it should be. Americans have become adverse to the concept of sacrifice, as if it compromises what we’re entitled to. But we now have solid proof that so much of our entitlement was based on shady credit practices, and there really was no there there. So, how do we turn lemons into lemonade? We can look backwards to where we originally came from – the city centers and their inner-ring suburbs – and explore the opportunities they present. The empty houses in the city of St. Louis and the original suburbs that surround it are the key to living smarter. All amenities, utilities and infrastructure are already in place and can easily be reshaped to meet our current standards of living. The daily awareness and acceptance of green living now pairs perfectly with financial downturn, and solutions that can benefit us all are right under our noses. The greenest buildings are the ones already standing, and retrofitting an older home for energy efficiency is quickly becoming a remodeling industry standard, which means demand reduces the price of doing so. 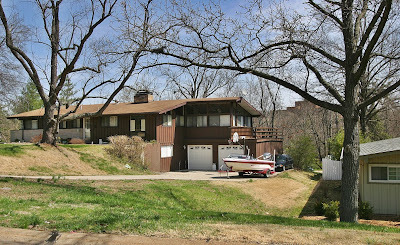 Plus, the state of Missouri is continuing energy efficient tax credits for homes and businesses in 2009. Couple that with the promise of an energy-conscious president, and more tax breaks and incentives for retrofitting existing older homes becomes a real, national possibility. Statewide, imagine the positive financial growth that can happen by encouraging people to move back in and remodel existing homes, businesses and retail. There is little debate that historic tax credits are the primary catalyst for the revival of downtown St. Louis; expanding this concept to help private homeowners and small businesses benefits everyone. For instance, sizable pockets of South St. Louis have been revived by recent immigrants buying and remodeling existing storefronts; drive through the now-bustling Bevo Mill area for tangible proof that what once was is also what can be. These Eastern Europeans instinctively understand the thrift of reviving existing density through sweat equity and old-fashioned loans. Throw in usable tax incentives and credits, and we natives can do it, too. We can no longer afford to keep reinventing the wheel, especially when the basic concept of the wheel is what made civilized progress possible. If we view a 1,200 s.f. 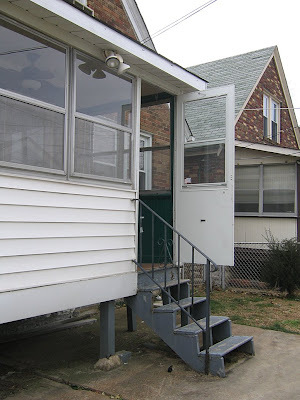 house in Ferguson through the lens of a McMansion, it’s a downwardly mobile downgrade. But if we look at it through the lens of possibility – reconfiguring floorplans, building additions, energy retrofitting – it becomes a potentially rewarding endeavor. Even without state or national government intervention, we are already learning (or is that re-learning?) how to better use our resources. We don’t really have much say in the matter, and the survival instinct serves us well. We are constantly being told that things will get much worse before they get better, and this is true. Part of “much worse” is the honest threat of losing what we currently have. But the options we have ahead of us need not be a consolation prize. We have already begun the process of retrofitting our lives, and if all levels of government could work with us on retrofitting our built environment, the opportunity to apply ingenuity and responsibility can create future gains from our current losses. Each new empty house on your block is cause for worry: down goes property values, up goes the potential for crime. The bank that foreclosed on that home is not your new neighbor; they are your new problem. We often have a tendency to not want to get involved: it’s their problem, not mine. But when there is no there there, it’s in your best interest to get involved. It may not be possible now, but in the future, someone can buy the house next to you if it has been protected. So, protect your investment, your block and your neighborhood with a little extra effort. Please keep an eye on the newly empty houses on your block. Act as if they are on a long vacation and make the effort to clear up any obvious signs of abandonment: phone books on the porch, newspapers in the yard, etc. If a sunporch door is flapping in the wind, try to secure it. Try to turn off any neon signs advertising the house as a sitting duck. If this is more than you can or will do, then please let someone else know so they can take care of it. Contact the Citizens Service Bureau about any problems with a vacant house. Let them do the research and enact the solution; that’s what they are here for. Call 314.622.4800, or online at this link. It is easy, painless and gets results. There are two key factors that turn a block bad: fear and apathy. We tend to apply this to new and unusual additions, but it applies double to this new wave of subtractions on our blocks. A foreclosure devastates the family it happened to and reverberates out to the neighbors who remain. You can ease this sense of helplessness, and pay it forward, by helping out now with a little bravery and concern. Please. While taking a new shortcut to Big Bend and Interstate 270, I looked down into a valley along Craig Road and saw a storybook village of mid-century ranch houses. Because it was the end of winter and the trees were bare, the houses were plainly visible. Once the trees are fully in bloom, the houses are hidden under a sylvan umbrella. 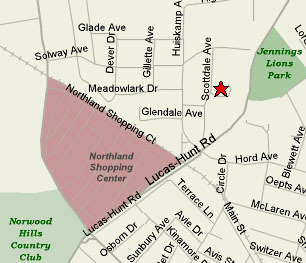 Craigwoods is a 4-street tract tucked into a bowl behind St. Josephs Hospital. Kirkwood is known for a large stock of picturesque historic homes, though it’s actually far more eclectic than popular notion. 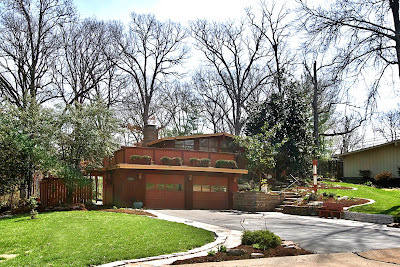 There are several decades worth of custom homes built in popular styles of the day, with quite a lot of mid-century and post-modern homes resting peacefully next to quintessential Kirkwood historic architecture. 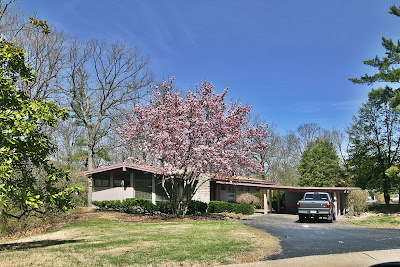 This small but rambling subdivision was built from 1953 to 1955. 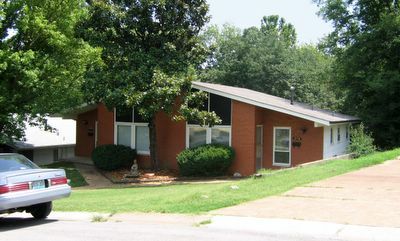 Houses range from 1,300 – 3,000 s.f. Many of the homes still have the original owners living there, and when listings for them do appear, they sell quickly. Lately, Kirkwood has been battling a teardown plague, but as of this writing, there are only 2 instances of new in-fill housing in Craigwoods. Both are large, multi-story jobs inappropriate to the horizontal neighborhood, but because the lots are large, hilly and tree-filled they don’t stick out as jarringly as is usually the case elsewhere. Because the subdivision is so hilly, there are many split-level ranches, which then provides more opportunities for outdoor terraces, usually over the multi-car garage. One characteristic of the uniquely American ranch house style is the attached garage. But rather than the garage eating up half the facade, the ranch style originally found ways to discreetly tuck it into the design so it didn’t call too much attention to itself. Moving it to the backside of the house was a popular option, and made more sense for families. Since everyone was in the backyard anyway, all the stuff needed for outdoor living was neatly stacked into the garage. 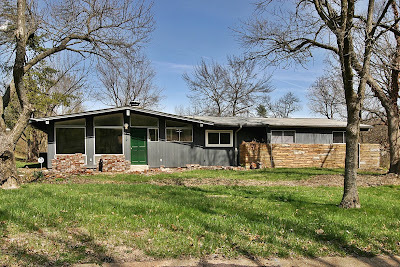 That was the original beauty of the ranch style: a new, informal residential architecture that took into account how American families actually lived after World War 2. Here’s a house in Craigwoods that’s undergoing renovation. So far, they appear to be staying true to the original feel of the house. 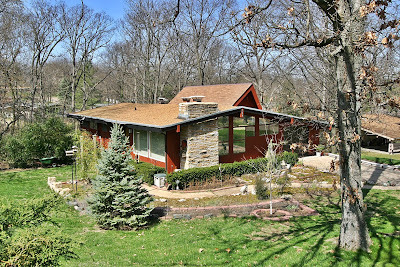 A good friend of mine is a buyer’s agent specializing in finding mid-century homes for those so aesthetically inclined. She has noticed that buyer’s have a tendency to become disenchanted with the houses she shows them because so many of them have been remuddled and would require remodeling to return them to their former glory. In general, most every new owner of an existing home has to do some form of renovation; that inevitable expense is usually factored into the overall cost of purchasing the house. But for some strange reason, some who want an MCM ranch house hold onto the unrealistic expectation that they will easily find an untouched gem and simply move their stuff into a dwell dollhouse. I think this speaks more to a certain lifestyle mindset than the reality of buying any type of house over 20 years old. The typical American ranch home is now – or very close to being – officially historic. One must put on their “historic rehab” thinking caps and undertake the adventure. Here’s a thoroughly illustrated example of a family who did just such a thing with just such a house. This style has been called the true twentieth-century vernacular mode. Its compactness and simplicity and its use of many stylistic features dictated by the experience of builders and contractors made it the most commonly used style for the thousands of subdivision ranch houses being constructed all over America…. 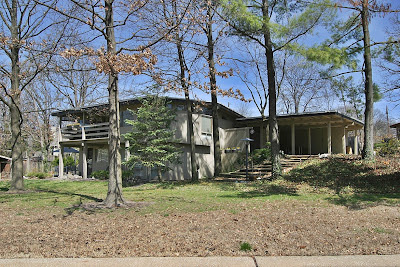 The contractors used (Frank Lloyd) Wright’s ideas but built expediently with factory-made, often synthetic, materials, such as imitation plastic stone, pressed fiber imitation wood siding, and metal shutters and siding. From a fascinating New York Times article in 1982, suburban homeowners (who put style 9th on the list of important factors in choosing a house) chose the ranch as the third most popular option, perceiving it “as economical, modest and simple.” Fast-forward to the financially-and energy-challenged 21st century, and “economic, modest and simple” seems once again a virtue. As if Northland being demolished wasn’t hard enough, I found my childhood home behind Northland (on Meadowlark) now boarded up and condemned. A tangible piece of my personal past is being wiped off the map, and the timing of it borders on overkill. The neighborhood itself is a classic hodgepodge, with homes ranging from the early 1900s to the late 1960s, and while half of the houses are as crisp as I remember them, the other half are abandoned and rotting. We always traversed this neighborhood on foot, so I knew it intimately…or so I thought until I took a turn down a street I’d never been down before. This small area couldn’t be more tucked away and ignored, and thus has no compulsion towards suburban civility, feeling more like a bayou swamp settlement. In the midst of Midnight in the Garden of Good & Evil I discovered a portal into The Modern WayBack Machine. 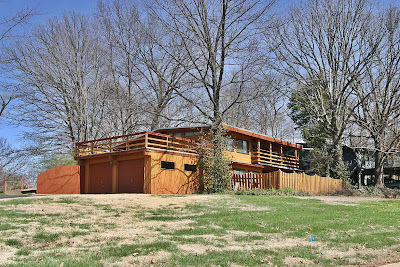 By taking a curious right and heading down a steep hill, I rolled back in time to a Jet Set Duplex Park. A paisley-shaped street is ringed with pristine examples of optimistic car culture multi-family dwellings, all butterfly winged carports and picture windows. There were a few variations on the theme (above), but all are low-slung duplexes lovingly tended to. I was numb as I stood gawking in the middle of the court, feeling as if I’d stepped into a 1960s postcard. The intense heat of the day made my head woozy, so I assumed I was imagining this clean and precise oasis of residential modern in the midst of a forgotten swamp land. But it was true! On this island, martini shakers still rattled at hibachi BBQs while alligators and scorpions surely lurked in the overgrown lawns of the homes outside this bubble. How did I miss this place all these years? I asked my parents about it, and they, too, had no idea it existed because they didn’t even realize you could go east of Huiskamp Ave in that neighborhood. So I didn’t feel like such a dunce for overlooking it. Plus, it’s tucked into the valley of a large dead end. 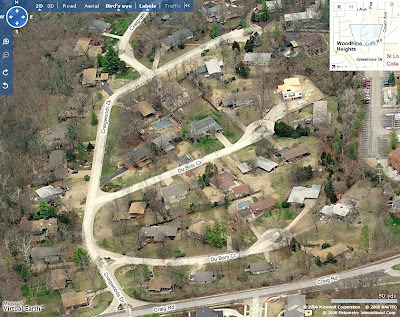 St. Louis County property tax records show that my Mid-Century Model Train Neighborhood was built in 1968 as Glenview Court. Meaning, it was built while we lived in the area, but sailed under the radar. Most every duplex still retains its original and unique metal medallion on the front facade (note tikki stone faces, above middle), and the owners sit in lawnchairs under their carports wondering why this chick is casing their court. I keep returning because it’s like the Demolition Gods threw me a bone, allowing a new chapter within the doomed pages of my architectural biography.